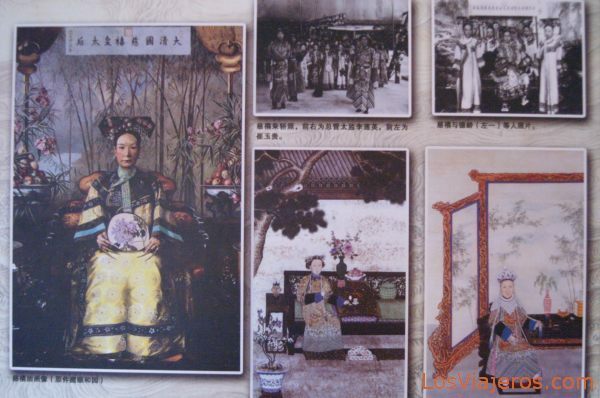 Fotografias del la familia imperial -Ciudad prohibida - Pekin - China: Las habitaciones interiores estan decoradas con muchos recuerdos familiares, aunque muchos de los mas valiosos objetos fueron llevados a Taiwan en 1948, para evitar que cayesen en manos del gobierno comunista. Imperial Family Beijing_ures -Forbidden City - Beijing - China: The collection of the Museum in Forbidden City is based on the palace collection in the Ming and Qing Dynasties. A significant portion of this collection was lost over the years. In 1948, the pick of the remaining collection were moved to Taiwan. The collection has subsequently been replenished, through donations, purchases, and transfers from other museums. Jardines privados en la Ciudad prohibida - Pekin Private Gardens in Forbidden City - Beijing "Index"